Though many states may experience the rainbow of colors that make up the beauty of Autumn, in Arizona, Fall colors are harder to come by. To find these beautiful hidden gems of color, a short trip to cooler climates within the Grand Canyon State is all you need for beauty that will take your breath away. If you’re looking for other fun and exciting ways to experience all the Fall events in Arizona, you don’t have to go far. Within just a couple of hours you can drive to destinations where you can experience all sorts of fun activities such as observing the marvel of Horseshoe Bend, taking a bone chilling ghost tour in exciting Bisbee, or a magical trip to the North Pole via train from Williams. With so many options, the only trouble you’ll have is deciding which place to explore first! Near Page, Arizona, lies a beautiful natural vista that is aptly named Horseshoe Bend. Inspired by its shape, the Colorado River creates a loop around the vista, reminiscent of a horseshoe. Just two hours north of Flagstaff, via the U.S. 89 highway, this natural wonder is just a ¾ mile hike from the highway. Though a short distance, the hike can be a bit challenging due to steep areas and deep sections of sand. Hikers should be well prepared with good walking shoes, hats and sunglasses, and pack plenty of water. Arrive in the morning for stunning views and best photos. For a more intimate experience, take the half day Glen Canyon Float trip aboard a comfortable pontoon-style raft. 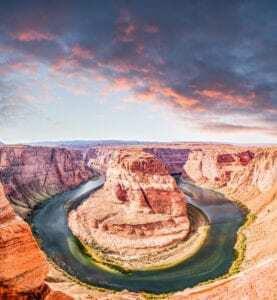 On this half day trip, you’ll enjoy a calm ride down the Colorado River, beginning at the base of the Glen Canyon Dam where you’ll view petroglyphs and the towering cliffs above Horseshoe Bend. A tour guide will accompany you and describe the flora and fauna native to the area as well as explain the history behind the sandstone cliffs, the area’s first explorers, and what role the river plays in the delivery of water and power within the Southwest. Beautiful shades of orange, yellows, deep reds, and browns not often found in the Phoenix area do exist within Arizona. With just a quick drive to Tucson, your longing for Fall colors is just an hour or so away. Though not as prominent as the colors you’d find in states such as Vermont or Indiana, you’ll still bear witness to the pockets of color that will give you all the Fall feels. Near the Catalina Mountains, just north of Tucson, you’ll see dazzling yellow leaves along the highway. Further into the Catalinas maple trees display leaves of rust and deep reds; just down the road from there, you’ll find the Aspen Vista, a scenic overlook area with pullout for drivers to stop and view the sprawling area of Aspen trees. Even further down, look for Turkey Run Road where a sea of maple, aspen, and Arizona walnut trees produce the rich autumnal hues that the heart and eyes desire. For a frightfully fun experience, travel to the once booming mining town of Bisbee, Arizona and take in a ghost tour. Over a century ago, Bisbee was a lively town with mines producing gold, silver, and copper. The once wealthy city was host to many posh hotels and shifty saloons patronized by executives and wealthy locals. Today, Bisbee is more of a tourist attraction, drawing ghost hunters and thrill seekers around the world. Witnesses have reported as many as sixteen entities in the infamous Copper Queen Hotel, alone. Brave souls can take one of six different ghost tours, each ranked by its scare factor. The Copper Queen Ghost Hunt is by far the most thrilling tour taking place in the famed hotel. Hunters must reserve a room in order to participate in the hunt and may witness former hotel guests that didn’t quite check out. For those choosing not to stay at the hotel but still want a haunting experience, take the Old Bisbee Ghost Tour. This walking tour takes you throughout the town to view common haunts that take place in the streets, stairways, and old alleys. For a more family friendly experience, take the Bisbee Historic Ghost Walk. This tour focuses on the history and spirits that reside in Bisbee. A more conservative experience, you’ll still enjoy ghost stories with less startling details. Throughout the month of October, the whole family will enjoy a trip on the Grand Canyon Railway’s Pumpkin Patch Train. The train departs from the Williams Depot and travels through the countryside to the pumpkin patch where each child will be able to choose his or her special pumpkin. Parents and children alike are encouraged to dress up in their favorite Halloween costumes. Upon return to the train station, children are encouraged to decorate their pumpkin and participate in other arts and crafts, escape from the puzzling maze on the platform, and take a chilling walk through the Haunted Train Car. Be sure to stop into Harvey’s Café to enjoy refreshments including hot beverages, homemade fudge, and other holiday treats. Beginning in November and through the first part of January, the Grand Canyon Railway offers a magical trip to the North Pole by way of the Polar Express. This night time only tour journeys from Williams to the North Pole where Santa Claus and his reindeer await your arrival. Parents and children alike don their PJs during this magical ride. Though there’s a chill in the air, steam heat billows through the train cars giving a warm and cozy feel. During the ride, children of all ages will enjoy the Polar Express story read aloud while sipping on hot chocolate and nibbling on chocolate chip cookies. The excitement builds as the train emerges from the dark forest and takes off from the plateau and suddenly, holiday lights in the distance grow brighter and brighter. When the train arrives to the North Pole, Santa boards the train and gifts each passenger with a special sleigh bell as a symbol of the spirit of Christmas. A trip to the North Pole and back takes approximately 90 minutes. Several packages are available including a stay in the Grand Canyon Railway hotel, roundtrip tickets for the Polar Express, and two meals per person. With the exception of the summer months, the wonderful weather in Arizona beckons for activities outdoors. Whether you’re traveling to the North Pole or to Tucson in search of Fall foliage, be sure your vehicle is equipped to make the trip. The Sun Devil Auto oil change includes a multi-point inspection to ensure your vehicle is ready for any kind of travel from your home to work or from home to Page to see Horseshoe Bend. You can count on our Certified Technicians to ensure your vehicle is travel ready by scheduling an appointment for your next service. That way, you can focus on what’s most important: enjoying good times and memories made from experiencing the seasons in Arizona.